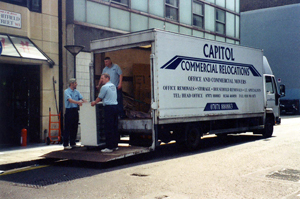 Capitol is a privately owned removal company who specialise in both office and household removals. The company was formed in 1997 by the Directors who have over thirty-five years experience in all aspects of the removal industry. Capitol operates from London & Reading and our services cover the United Kingdom and Europe. We offer a personal, professional service and each job is viewed as an individual project which is tailor made to the clients specific requirements. Capitol crews are caring and flexible and work to understand each client’s situation and needs. Capitols growth and success over the past years has been due to the personal touch given to each client and this has resulted in repeat business. We offer a professional and solid solution to your move. All our staff are fully trained in their particular divisions covering office, household, warehouse and all services to ensure a smooth and efficient removal throughout. Our professional removal services are available for domestic and commercial moves in Wokingham, Reading, Bracknell, Crowthorne, Henley, Ascot, Newbury, Guildford, Maidenhead, Windsor, Virginia waters, Slough, Watford, Basingstoke, Uxbridge, across Berkshire and London.